It’s almost March Madness time and the 2018 NCAA basketball bracket has finally been revealed. This year, the No. 1 seeds for the tournament are Kansas, Xavier, Virginia and Villanova. All over the country millions of March Madness brackets are about to get filled by office workers and basketball fans. By using our March Madness strategies, you will learn how to get a Winning March Madness bracket. So follow our tips and tricks and get ready to take home the pool money! The stakes are high with March Madness pool prizes ranging from a few hundred dollars to billions of dollars. During this period of time, people get to show off their NCAA college basketball knowledge. However, in the end only one person will be able to claim the title of being the best of the best! They are several ways to fill a March Madness bracket each according to the person filling it out. Some people fill it out based on their favorite team while others do it using basketball statistics. Pick the #1 and #2 seed to move past 1st Round. So keep this in mind when you fill out your bracket, upsets rarely happen. Since 1985, a #16 seed has never beaten a #1 seed and a 15th seed has only beaten the #2 seed 6 times out of 108 tries. Should You Pick a Cinderella Story Team? Historically, in the past 31 years, the #12 seed has won 34.5% of their total game. Just make sure that you pick a hot #12 team. Your online sportsbook may just know something that you don’t. Bookies make a living setting betting odds and a college basketball game does not always have the higher-seed as the favorite to win. So do yourself a favor and check your bookies odds before you make those picks. This is a basic rookie mistake where they pick all of the top-teams for a win. According to most sports betting software providers, the truth is that in the past 29 years, only once have all four top-seeded teams all made it to the Final Four. So keep that in mind as you fill out your bracket. The odds are that one of these teams will not make it. This one is simple common sense. If your March Madness pool allows it, get more than one bracket. Sometimes it only takes a few bad picks to turn a winning bracket into a loser. Increase your chances by getting multiple brackets. 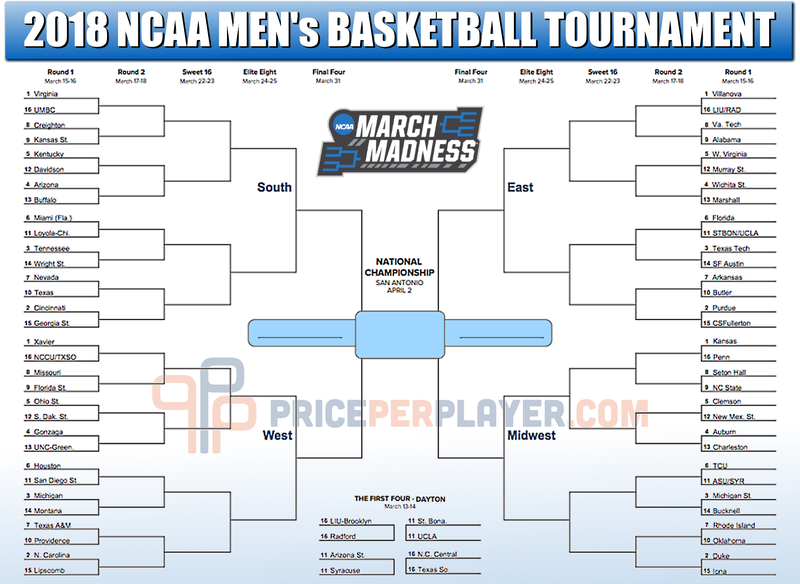 Now that you are ready to get a Winning March Madness Bracket, download the PricePerPlayer.com March Madness Bracket and start your own bracket pool.